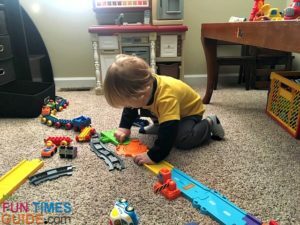 My son was given a few bags full of VTech toys from one of my husband’s co-workers. 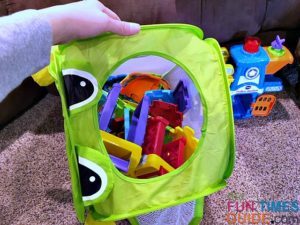 The bags were full of a variety of Go Go Smart Wheels cars and playsets. I had some prior knowledge of these types of VTech playsets and vehicles — because one of my Mama friends had purchased a set for her son and said her son would play with them for hours. 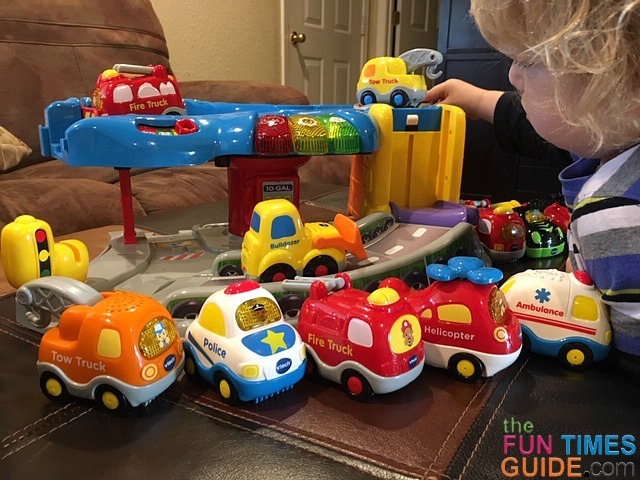 After months of our own experimentation and playing with the Go Go Smart Wheels playsets with my son, I thought other parents might benefit from my thoughts regarding the VTech Go Go Smart Wheels collection. 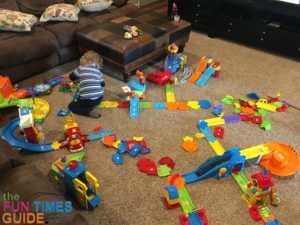 This article is completely based on my own opinion and experience with Go Go Smart Wheels vehicles and playsets after owning them for several months and watching my 2-year-old play with them. Like most new toys brought into our house, it was VTech for hours and days on end — building tracks, linking sets, and playing with the various the cars & trucks. 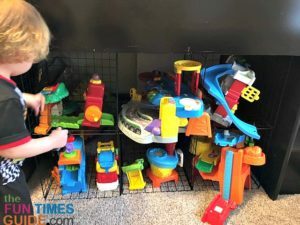 When I started doing research on how to piece the sets together, I quickly realized how many hundreds of dollars worth of toys my son inherited! Even though I didn’t pay a dime for any of these sets, I still ask myself the question if VTech Go Go Smart Wheels playsets and vehicles are worth it? I’ll start with the Go Go Smart Wheels cars — because my son loves anything with wheels! At first glance, VTech Go Go Smart Wheels cars are bright, shiny, and have cute faces on their windshields. There are a variety of race cars, bulldozers, ATVs, fire trucks, police cars, ambulances, helicopters, etc. Each one is some kind of vehicle with a happy face and lots of bright, shiny colors. Each vehicle takes 2 AAA batteries and has an on/off switch. I have found little to no battery replacement required since we first acquired them. So the cars don’t burn through the batteries. Each Go Go Smart Wheels vehicle lights up, sings tunes, and says phrases. Each one features an individual song that will typically describe what the vehicle is used for. Each vehicle also introduces its name. Each car has a little weight to it and feels extremely durable. Each Go Go Smart Wheels vehicle has smart sensors located on the bottom that trigger various sayings, depending which SmartPoint triggers it on the various playset tracks. VTech has a huge variety of Go Go Smart Wheels playsets (and vehicles) to choose from — so many, in fact, that it can be quite overwhelming at first glance. Each playset has different “SmartPoint locations” built into the tracks — which trigger the Go Go Smart Wheels vehicles to respond with lights, tunes, and phrases when they drive over them. The VTech Go Go Smart Wheels playsets are designed to help children ages 1 through 5 develop early language, imaginative play, and motor skills. I like that my son is building his fine motor skills while playing with all of the different mechanical moving pieces — like the launch pads, moving elevators, and stop/go levers. 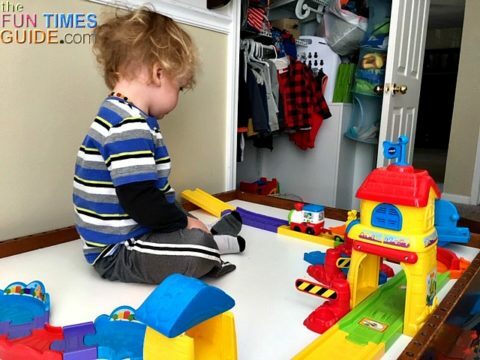 I enjoy creating and exploring this VTech Go Go Smart Wheels collection with my 2-year-old — because I love watching my son be so engaged and focused while he’s playing. 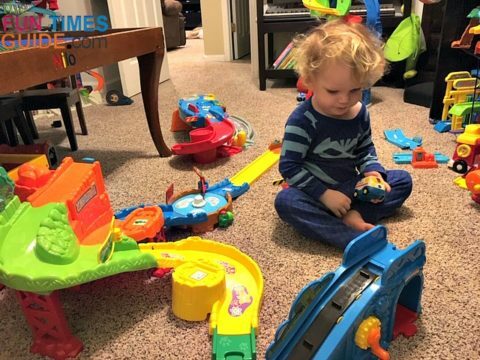 At times, he will carry one specific bulk piece of a Go Go Smart Wheels playset out of his room and just play with that one piece and a few cars. 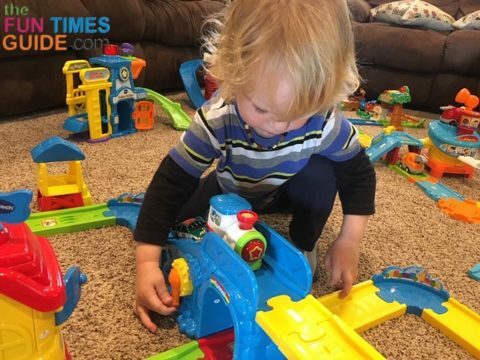 But mostly, he will build all sorts of tracks linking the big, easy-to-piece-together tracks of all shapes and sizes — even with his little hands. 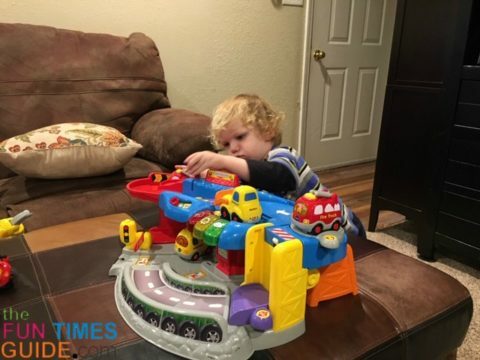 He enjoys driving the Go To Smart Wheels cars and trucks on the track and into the different playsets. Okay… so now that I have mentioned all the good and fun features, it’s time to discuss the bad and the ugly. These points pertain mostly to anyone who is considering acquiring a Go Go Smart Wheels collection for their little one. 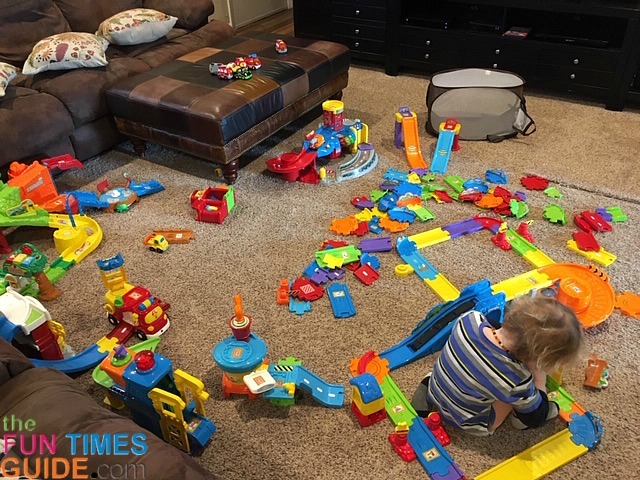 First of all, these VTech playsets require a lot of floor space to build tracks and link any sets together — not ideal if you live in a small place. The VTech playsets are quite cumbersome to store when not being played with. Currently, we use a wire metal storage cube rack under my son’s loft bed. The metal rack is perfect for storing the big bulky portions of each set — because the cube sizes are 14×14. We keep the rest of the linking track pieces consolidated in a collapsible laundry basket. 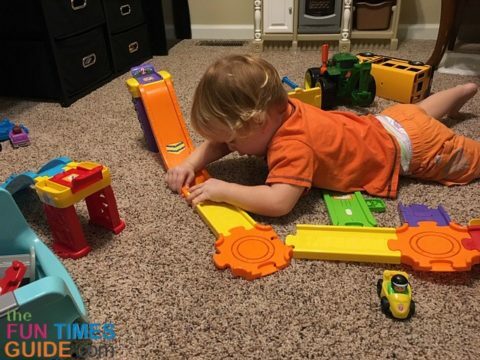 The VTech playsets have so many pieces to manage and organize while playing — so you really need to be in the mindset of building tracks and spending a lot of time playing what you’ve just built. Since we don’t have a lot of extra floor space to keep the playsets set up, each play session with these sets requires a ton of clean up and re-organization each time. Both the playsets and the vehicles require batteries to sing, say phrases, etc. I just want to stress the fact that repetitive-noise-making toys are not for everyone. We have been so blessed with the generosity from our friends and family who have provided an abundance of toys for our son. With that being said, I’m of the opinion that our collection of VTech Go Go Smart Wheels is excessive. But just when I think it’s time to pass the collection on to other kids who would enjoy them, my son will spark a new found interest in the VTech playsets and vehicles and start playing with them again. My choice would be the Go Go Smart Wheels Train Station playset. What I like most about this playset is that it has a motorized train and the track is interchangeable for multiple configurations. I think it’s the most versatile playset in VTech’s entire collection. 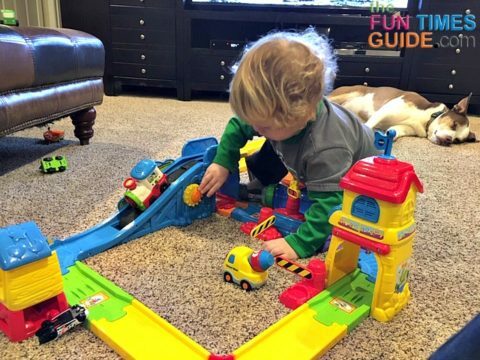 My son would probably choose the Smart Wheels Garage playset — because of the spiral ramp, fuel station, traffic stop/go lever, elevator, parking pad, and helicopter landing pad. It also has 3 light-up keys that teach about about colors and weather. 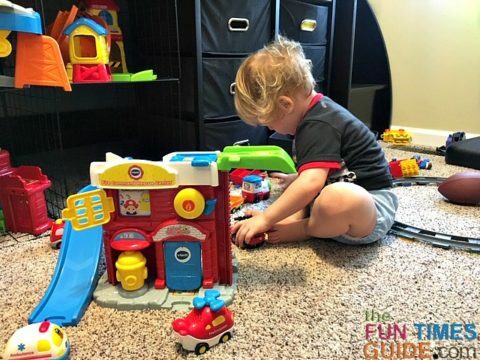 I hope that you’ve found my insights helpful as you’re contemplating whether to get a Go Go Smart Wheels playset or some Go Go Smart Wheels cars for your little one!